Welcome to The Daily Rios’ entry for the Super-Blog Team Up on Villains! For new visitors to the site, the Daily Rios began as a podcast, releasing episodes Monday thru Friday from July 2nd, 2012 to June 28th, 2013. That amounted to a total of 260 episodes in one year focusing on comics, TV, Movies, the performing arts, teaching and anything else that was worthy of sharing. Once that experiment was completed, the second year of the Daily Rios focused more on website posts (with a handful of podcasts thrown in) in a more relaxed release schedule. As of January 1, 2014, the site went back to the daily challenge: this time as website posts and/or podcasts released Monday thru Friday featuring views on comics or comic related projects. As you can see, the posts are a bit behind, and the podcasts are few and far between, but I’m jumping ahead with today’s special focus to release my topic for the Super-Blog Team Up event! When Charlton Hero of the Superhero Satellite sent along an invite to participate, I thought about using this as a chance to spotlight a different set of villains, maybe even obscure one-offs, particularly from the ’80s which is when I started collecting comics on my own. Anyone remember Paragon from Justice League of America? Or the Moondancers or Null and Void in World’s Finest Comics? What about Sunburst in the New Adventures of Superboy? Blackbriar Thorn appeared in a single issue of DC Comics Presents years before being resurrected out of limbo for a stint in the JSA series of the early ’00s. From that list of obscure but interesting villains, I decided upon the following. Justice League of America #221-223, cover dated Dec’83 thru Feb’84, introduced readers to a new, single story group of truly ruthless villains in a trilogy entitled “Beasts”. Although they would finally be named as Ani-Men during the final chapter, for me, they will always be the Beasts. The story is written by longtime JLA writer Gerry Conway, edited by Len Wein, with colors by Gene D’Angelo, letters by John Costanza and Phil Feliz with the clean, accessible art of Chuck Patton polished off by the inking of Pablo Marcos and Romeo Tanghal (to put this story into context, we’re just about one year away from the Detroit years of the JLA). If the cover date of Dec’83 means the book shipped in October, I was ten just turning eleven at the time, buying comics off the racks for myself for only maybe a year or so. And this was probably my 6th or 7th JLA issue. So if this was thirty years ago, why am I focusing on such a far off group of villains? 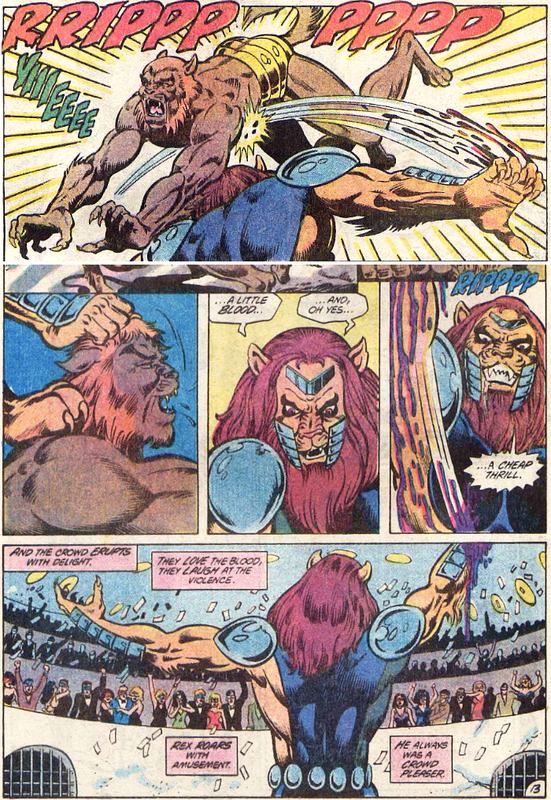 Because like the Monkey King story in Swamp Thing by Alan Moore, this story still resonates with me. Read on! The story itself opens with a prologue that will mirror a bit with the ending: a group of wealthy spectators frequent a new and intense form of entertainment in hopes of easing their boredom. We don’t see what they are watching but it’s not hard to tell what’s going on by the audience’s ferocious and blood thirsty reactions: somebody or something is fighting for their lives and it’s all meant to be sport for the wealthy, the elite and the powerful. They are entertained by it. They get off on it. They place themselves above others in their quest for something new. The caption reads “presenting the most horrifying case of the JLA”. This was no idle boast. We follow this opening with a series of robberies around various JLA base of operations introducing the team and the readers to this group of vicious were-people: a half-man/half-whale that manages to get the best of Superman and Wonder Woman in Metropolis Harbor; a half-man/half-rhino practically gutting the Flash with its horn in Central City; Elongated Man pecked and scratched by birds with human eyes in San Francisco. All vicious, surprising attacks that seem to catch the members off guard. Through the team’s youngest member, Firestorm (a Gerry Conway co-creation and another ’80s series I coveted), we meet Reena the cat woman – a renegade from the others who is looking to reveal the true nature of Repli-Tech, the company that created the beasts. 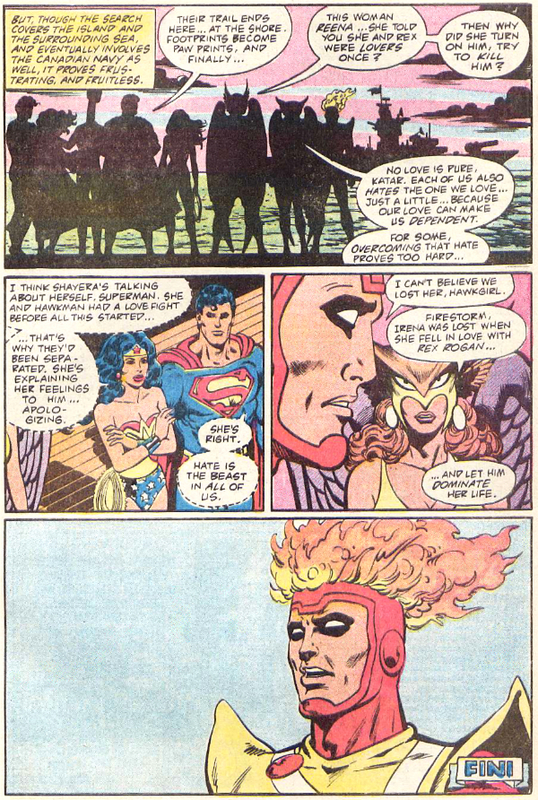 Learning that she is on the run, Firestorm brings her to the JLA satellite to tell her tale to the others. We then cut to a scene in Egypt where another attack occurs, this time by human scorpions who manage to sting and poison Hawkman as he’s on an archaeological dig in his secret identity of Carter Hall. By the end of part one, we are finally given a face to a name that’s been dropped throughout the issue. We finally meet the lion man and leader of the beasts known as Maximus Rex! Part Two opens with Reena revealing the truth of the Beasts to the JLA, detailing how they were all members of a greedy corporation that decided to take extreme measures when they learned they were losing their fortunes. Corporate greed was all the rage during the 1980s and this group decided that altering their DNA in hopes of true power was a better fate than disgrace and imprisonment. With a head scientist named Dr. Lovecraft (nothing subtle there) of course we’re hit with concepts such as protein-acid baths, Retroactive-DNA-Recombination, pulsating cocoons, and finally, the beasts themselves: Maximus Rex the Lion Man, Reena the Cat Woman, a half-man/half-snake and others. We learn that Reena wasn’t the only renegade. Another beast named Rowl, who is part canine, helped Reena to escape. 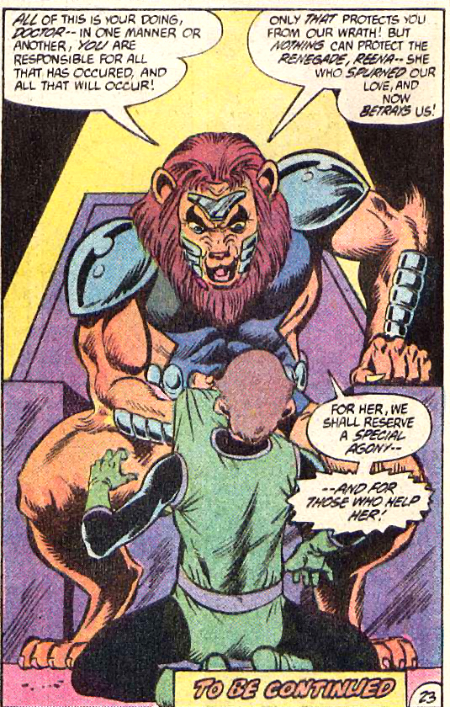 But he is captured and forced to fight Maximus Rex in quite a gruesome battle for an all-ages comics of the early ’80s. I wonder if the purple blood coloring was a way around the censors. The below scene and the attacks on the JLA in part one are why this group of characters have strongly imprinted on my brain: they are vicious. Remorseless. Brutal despite their all too common comic book origins. Throughout Reena’s origin story of the Beasts, it is Hawkgirl who has the most doubts about its honesty, especially when she learns that Hawkman has been poisoned. Learning of Carter’s attack sends part of the team to Egypt where they are assaulted and captured leading to one of the best cliffhangers of the series. 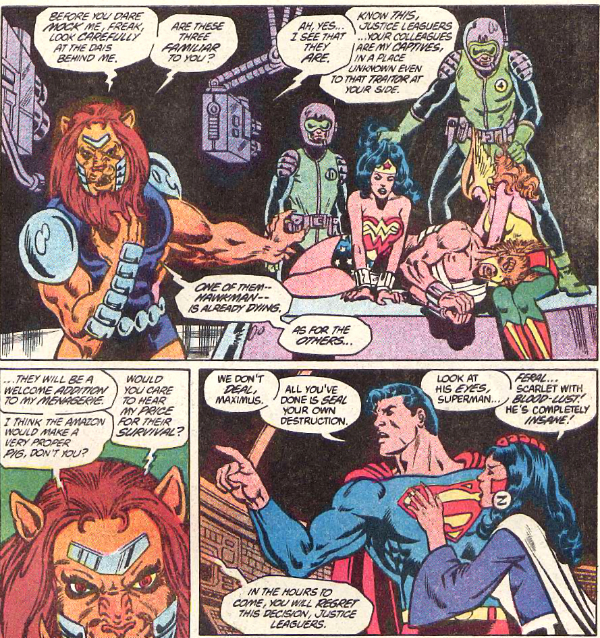 Over a viewscreen, Maximux Rex bargains with the JLA requesting Reena be handed over to him in exchange for the captured JLA members. It’s typical comic book fare, and his taunts are incredibly inflated when you think about who he’s dealing with in the JLA. However the scene is well paced by both script and art. The feral look in Maximus’ eyes. The anger and unsettled nature of the JLA as they come face to face with their enemy. The look of sheer anger on Superman’s face. Yes, logic demands that this group of villains should be a washout for the League – that they really shouldn’t be that much of a threat. But the set up and the promise of a stunning ending worked. I was rooting for the JLA in ways that rarely occur when they’re battling Amazo. Or the Royal Flush Gang. Or Kanjar-Ro. 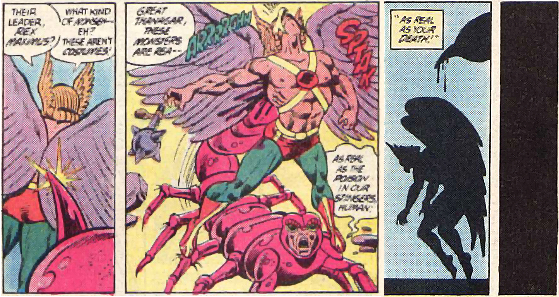 These kind of villains set up elaborate traps to capture the JLA, to banish them, or to just delay the team. And they certainly don’t always bring the JLA to such an emotional state. The Beasts wanted destruction, humiliation, fear and death. Very passionate and dark emotions at a time when superhero comic book villains were comic book evil, not always evil evil. With Part Three, the beasts are given a name: the “Ani-Men”. And the JLA finally goes on the offensive. Zatanna, magically disguised as Reena, gives herself up to Maximus in order to get in close. A recovered Elongated Man joins Firestorm and Reena in capturing Dr. Lovecraft for his information on how to save Hawkman. 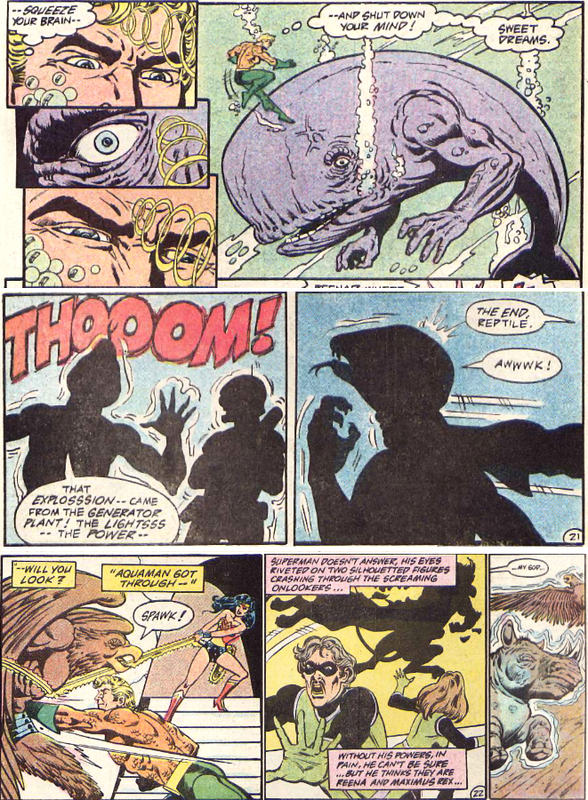 Aquaman confronts the half-man/half-whale, known as Gargantus, and manages to shut him down with a focused telepathic blast. Eventually, with the help of Reena, the JLA manage to rescue their teammates and engage in a final all out battle for survival with the Ani-Men. And you can tell they are not holding back. The battle takes a backseat however to the main theme of the three issues as we get a brief glimpse of a silhouetted fight between Reena and her once love Maximus Rex. We never learn of this outcome, and the rest of the Ani-Men suddenly morph into real animals, ending their threat just about as quickly as it all started. We can surmise that Reena and Maximus fell to the same fate since, as is the way of these things, the Beasts eventually defeat themselves. It’s not a clean uplifting end to the battle, and I like to imagine this particular case sat with the JLA for a while. It’s the kind of wrap-up to a battle that leads to confusion and exhaustion rather than celebration. By the way, you can see Gerry Conway bringing Aquaman to the forefront in this final battle sequence. Aquaman would eventually take on a leadership role in the events that would disband the JLA and lead the way to the Detroit era – showing how much of a threat he can be in this story helps to ease that transition. In the epilogue, almost in counter to the opening prologue, the JLA are presented as having a great weight upon them. Very still. Almost mournful. They won this case, but at great cost. 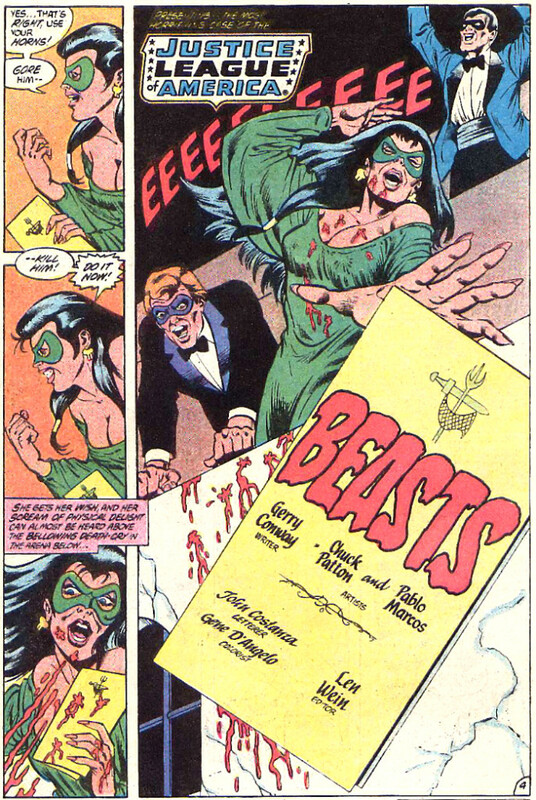 And here’s another connection to the opening: the JLA recognize that the beasts are in all of us. They were in the human spectators from part one. They were brought out of the men and women who became the Beasts. And they were in the JLA as they gave in to anger and other emotions during the final confrontation. When we learn that there has been some marital strife between the Hawks, Superman acknowledges that “hate is the beast in all of us”. The story ends with a great shot of Firestorm who is at a loss for words, no doubt wondering what became of Reena and questioning whether or not she too was just a victim of the hate inside herself. Heroes are only as good as their villains. And readers invest themselves in stories when the stakes are high and tension and conflict are believable. The Ani-Men felt real and powerful and savage in ways not frequently presented, accompanied with some interesting if not typical animalistic designs. The artwork may be too “bright” for such a story, but I feel that contrast makes the horror of it stand out more and brings it right out into the open. The Beasts only lasted for three issues, but it was enough. And that is why I decided to give these one-off characters a feature. So grab these issues if you find them, and be amazed that this was presented in one of DC’s flagship titles – in an era of DC not usually known for its sense of danger, violence and emotional conflict. And if you like this feature of the Super-Blog Team Up, be sure to check out all of the other entries linked below! Flodo’s Page: Villainous Villainies Of The LampLighter! Silver Age Sensations: The Voracious Villainy of The Crimson Dynamo! The Super-Hero Satellite: Darkseid: The Great Darkness Saga! I remember this now! 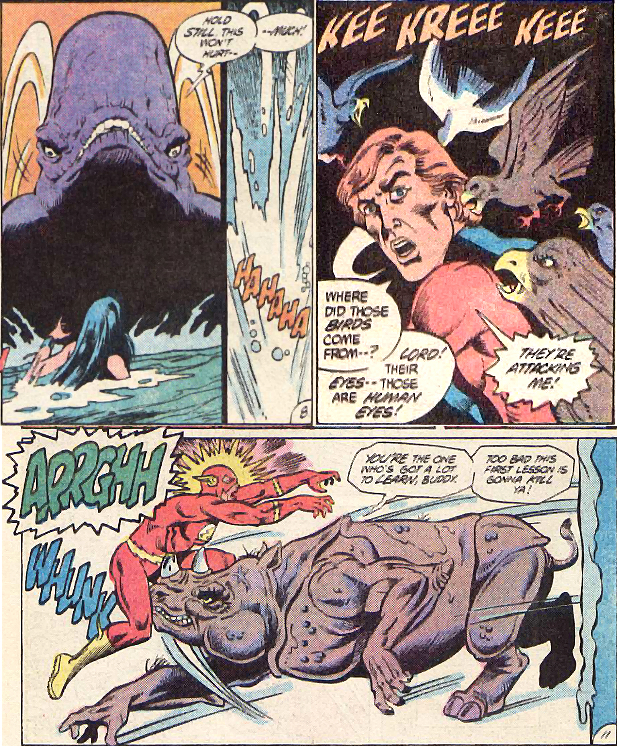 The Beasts were a lot tougher than they ever should have been for the JLA! Loved the post Pete! Very fun look back at some of DCs pre Flash Point/Crisis/name you continuity crushing event! Would love the New52 DC to swing a Beasts appearance in for us old timers! As well thanks for jumping in with the team! It means a lot to me personally! Firestorm is being taught the meaning of life at the end there. 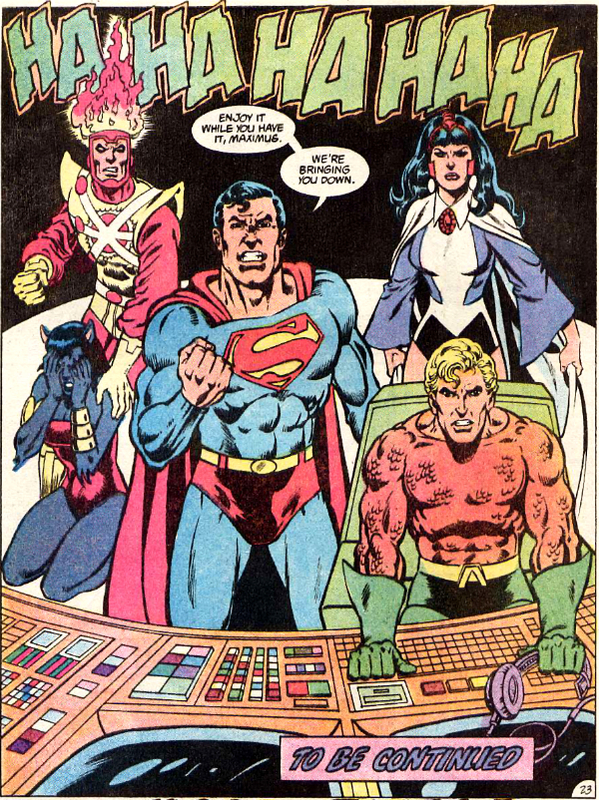 I always liked this JLA, but when one looks at that lineup, you wonder who could ever really threaten them. Firestorm and Zatanna could reshape reality for the love of God, and we ain’t even gotten to Superman yet! Yep its the PERFECT version of JLA! Loved FireStorm like he was back in the day. The new versions simply awful. They have not come close to Firestorm since this version. JLA in the early 80s was as close to perfect as you can get. I remember thinking the same thing, back in the day. This was one of the earlier JLA stories I read also and made me go back to the spinner rack each month to read the next chapter. I loved The Island of Dr. Moreau, both the book and the movie starring Michael York in 1977, and these beasts reminded me of the same sad and savage nature of the Beasts. Thanks for the reply Mick! I hadn’t thought of that angle – with Dr. Moreau. I haven’t ever read that book (or viewed the movie) so that’s a nice element to add.